Independent counsel • If adopted, the city attorney would no longer advise the civilian review board. 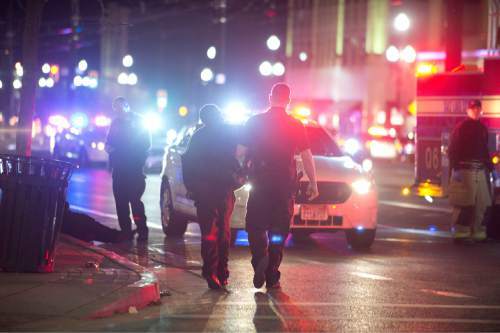 Lennie Mahler | The Salt Lake Tribune Police arrest a man from a crowd that formed after an officer-involved shooting at 200 South Rio Grande Street in Salt Lake City, Saturday, Feb. 27, 2016. 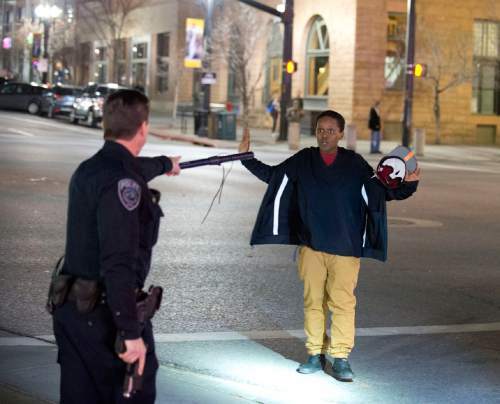 Lennie Mahler | The Salt Lake Tribune Police stop Selam Mohammad as the 19-year-old walked away from a crowd that formed after an officer-involved shooting at 200 South Rio Grande Street in Salt Lake City on Saturday. 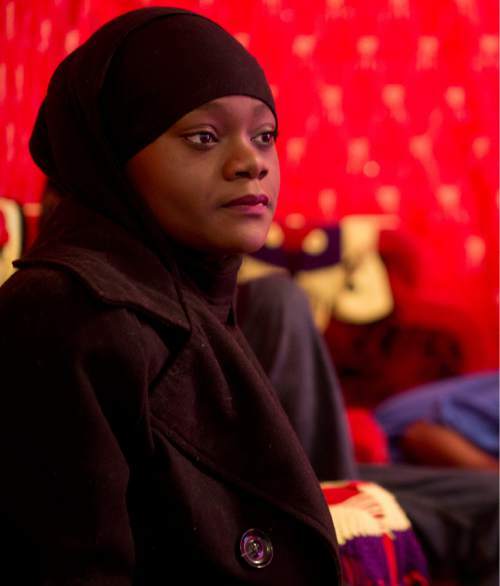 Lennie Mahler | The Salt Lake Tribune Muslima Aden, cousin of Abdi Mohamed, has acted as the spokesperson for the family following the police shooting of Mohamed on Feb. 27. Aden said she gets about 100 calls every day from media, city officials, family and friends. The Salt Lake City attorney&apos;s office may have conflicts when it gives legal advice to the Police Civilian Review Board that investigates officer-involved shootings. On Tuesday, the City Council will hold a public hearing at 7 p.m. inviting comments on a budget amendment that would, among other things, fund independent legal counsel for the review board. The council&apos;s awareness of how the board operates has grown with recent officer-involved shootings and is not an outgrowth of a lawsuit brought by Sean Kendall for the shooting death of his dog Geist, said Councilwoman Erin Mendenhall. The city attorney&apos;s office protects the municipality, she said. That could lead critics to allege the city attorney may be disinclined to provide the review board with advice that could compromise the city legally. Mayor Jackie Biskupski called for such an independent counsel in her State of the City address in January, the first anniversary of the shooting death of James Barker, 42. The review board found the shooting justified as it also did in the shooting deaths of Dillon Taylor, 20, in August 2014; and that of Geist, the 2-year-old Weimaraner, in June 2014. The board is designed to be independent of other investigations and its findings are nonbinding. Those shootings also were investigated by Salt Lake City police and the Salt Lake County district attorney. Both found the shootings justifiable. A case that has yet to come before the civilian review board was the Feb. 27 police shooting of Abdullahi Omar Mohamed, 17, who was critically wounded on Rio Grande Street near The Road Home shelter. In the 2014 dog shooting, Kendall, Geist&apos;s owner, has sued Salt Lake City and also has challenged the review board&apos;s finding. The board determined that Officer Brett Olsen was within his rights when he shot the dog in Kendall&apos;s backyard during a search for a missing 3-year-old child. When the officer entered Kendall&apos;s yard, the dog became aggressive, according to the review board&apos;s report. Fearing he might be bitten, Olsen shot the animal. The review board reached its conclusion after legal advice from the city attorney&apos;s office that during a life-threatening emergency, officers have the right to conduct warrantless searches. The child was later found safe at home. Former Salt Lake City Mayor Rocky Anderson, an attorney, represents Kendall in the suit and maintains the review board received improper advice from the city attorney. According to the lawsuit, the city attorney did not advise the review board that there must be cause to believe the danger existed specifically in Kendall&apos;s house or his yard. The police were searching a broad area a quarter-mile from the child&apos;s home and had no information about a specific location. Anderson pointed to the Fourth Amendment that protects against such warrantless searches, unless a nexus can be drawn between the emergency and the property in question. Kendall&apos;s backyard enjoys the same right of privacy as his house, Anderson said. City Attorney Margaret Plane said Friday that her office did not give improper legal advice and disagrees with Anderson&apos;s interpretation of the law. Deeda Seed, a former City Council member who also worked in the Anderson administration, is among a group pushing for independent counsel for the review board. "We need to take a look at how the civilian review board operates," she said. "We have to talk to people who have served on the board and ask them how it works and whether they were pushed [in one direction or the other]." The review board, as now configured, was established by Anderson 10 years ago, Seed said. "There are a lot of us questioning its effectiveness." When it comes to police matters, public perception is important, said Council Chairman James Rogers. Independent counsel would bring more transparency to the process, he said. "Having independent counsel is one of the ways to do that," Rogers said. "I think the public deserves that."